This week’s theme is pretty fun to do. I’ve spent a lot of time flipping through old comics in preparation for it. It’s funny how some comics seem like I drew them only a few weeks ago but they are over a year old. The opposite is also true, there are some comics that I barely remember making but I just drew them 2 weeks ago. 284 + 307? Hand and Mix. 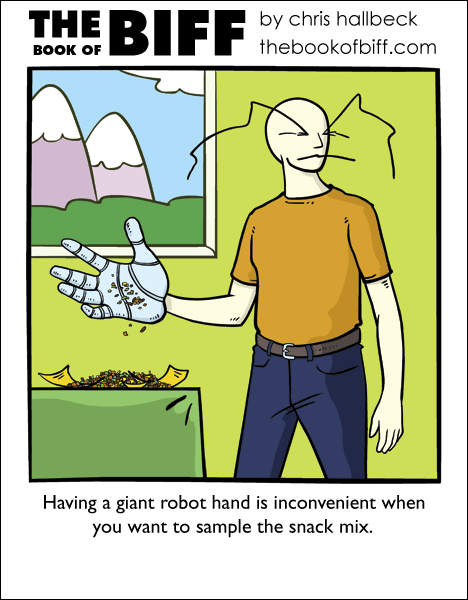 Giant robotic hands would probably interfere with a LOT of day-to-day activities. what can that hand not inconvenience? @stonehydra – smashing the garbage down into the can so you can wait an extra day before you have to take it outside. I love this weeks theme! Combining classic Biff comics, fantastic idea! Great comic ^.^ I remembered both strips mentioned here just like they showed up yesterday. I don’t know if you’ll read this or not, but I have a suggestion. And no. it’s not a suggestion of what the next comic should be. What I suggest is that you tell us which of your old comics you drew inspaeration from while making your combined comic. You could do this by posting a link to the old ones in your comment box that you always put under your comics. If you do end up doing this, then might I also suggest that you go back and put said links in all of the comics of this weeks theme. This theme is so awesome and unique, just like the comic. It’s perfect! Here’s to many more years, Chris! Also, the new site design is very nifty! A nice change without a new, alienating look. @APic – I think others are having fun trying to guess what the old comics are. If you look up in the comments you will see links to the correct comics. why doesn’t he use his other hand? I’m really enjoying this week, BTW! I can’t wait for number 500. His house is farther away from the mountains. I like the new site. I actully remember this one. ^_^ I bet that hand would be handy for opening stuck jars. The hand keeps the lotion from making the mix stick. Very smart Biff…. I’m a HUGE fan of the Giant Robot Hand. Make more of it! It’s just so implausable, and it’s made even funnier when you never bring up why he would have one in the first place.